"Batman created by Bob Kane, Superman created by Jerry Siegel and Joe Shuster, Wonder Woman created by William Moulton Marston." Originally published in single magazine form in Batman/Superman/Wonder Woman: Trinity # 1-3. DC Comics. Used - Very Good. Ships from Reno, NV. Former Library book. Great condition for a used book! Minimal wear. 100% Money Back Guarantee. Shipped to over one million happy customers. Your purchase benefits world literacy! DC Comics, 2004-06-01. Hardcover. Used:Good. DC Comics, 2004-06-01. Hardcover. Good. DC Comics, 2004. first printing. 1st. Hardcover. Fine/Fine. Hardcover. DC Comics. Hardcover. 1401203094 Please allow 4 - 14 business days for Standard shipping, within the US. Thank you for supporting our small, family-owned business! . Fair. 2004-06-01. DC Comics. Hardcover. 1401203094 Please allow 4 - 14 business days for Standard shipping, within the US. Thank you for supporting our small, family-owned business! . Fine. 2004-06-01. DC Comics. Hardcover. 1401203094 Please allow 4 - 14 business days for Standard shipping, within the US. Thank you for supporting our small, family-owned business! . New. 2004-06-01. DC Comics. Hardcover. 1401203094 New Condition *** Right Off the Shelf | Ships within 2 Business Days ~~~ Customer Service Is Our Top Priority! - Thank you for LOOKING :-) . New. 2004-05-06. Good. Ships with Tracking Number! INTERNATIONAL WORLDWIDE Shipping available. May not contain Access Codes or Supplements. May be ex-library. Shipping & Handling by region. Buy with confidence, excellent customer service! DC Comics. Hardcover. 1401203094 Like New Condition. . Fine. New York, NY: DC Comics, 2004. First edition / first printing (stated). Signed by Matt Wagner with just his name on the title page along with doodles of the symbols of the 3 characters. 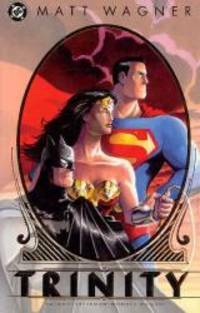 Originally published in magazine form in Batman, Superman, Wonder Woman: Trinity #1-3. Book is in fine (unread) condition with a fine unclipped dustjacket protected in a Brodart wrapper. An Attractive Copy! Please feel free to ask me for pictures or more information, Thanks. . Signed. First Edition. Hard Cover. Like New/Like New. DC Comics. Hardcover. 1401203094 New Condition. . New.